Shopping online classifieds and placing your own classified ads has never been easier! Now with improved features and selling options to better serve you. Enter today for a chance to dazzle mom! Receive $10.00 OFF Jiffy Lube Signature Service Oil Change. Stop in today and get $1.00 OFF one of our delicous cold hoagies. No deliveries. Receive $2.00 OFF any $10.00 purchase. Valid on food & drink items only. Download the Franklin County Connect App below to access these deals and many more! Looking for a new career? Join our team of advertising professionals. Browse local pets/livestock for sale including dogs, cats, etc. 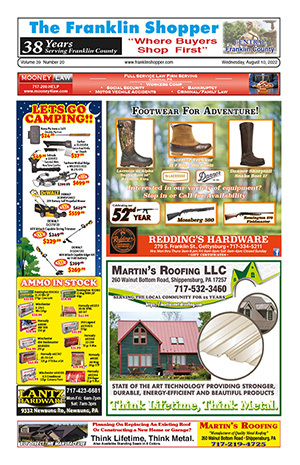 Check out local firearms and hunting accessories for sale. Browse new/used vehicles including cars, trucks, SUV's, and recreational vehicles. Msg & data rates may apply. To unsubscribe, text STOP to 313131. For help text HELP anytime. Up to 10 msg/mo. Your privacy is always protected and your information will not be shared. Find the best deal when it's time to refill your gas tank. Compare gas prices from local gas stations, convenience stores, and grocery stores. 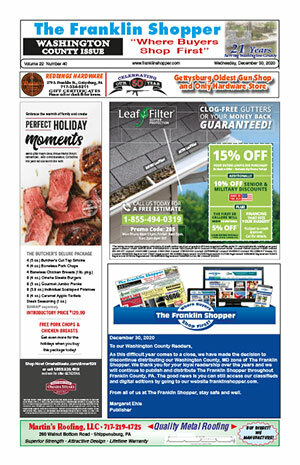 The Franklin Shopper is your source for print and online advertising in Chambersburg, PA and Hagerstown, MD. We are also the best source for local deals & coupons, classifieds, and shopping in the Franklin and Washington County areas. Need to sell your item quick? Place a classified online today!